Controversial Comfrey: Super Healer or Lethal Poison? The second crop of comfrey is flowering in late July. A very persistent stand of comfrey at our camp got me wondering about what it is good for, and why it is now regulated in various countries, including Canada, Australia, Germany, Japan, and the US. Can a plant with comforting folk names such as Knitbone, Woundwort, Healherb, and All Heal, really be all that bad? Why is comfrey mired in controversy? I started my search at Herbs Are Special, an excellent place to find out about the plant’s history and constituents. I am going to summarize historical uses, the case against comfrey, and provide some pro-comfrey anecdotes. Comfrey, what is it good for? In 50 AD, Dioscorides’ Materia Medica prescribed comfrey to heal wounds and broken bones. Since then, other herbalists have claimed the plant can help heal any body part that is torn or broken. Comfrey roots and leaves contain allantoin, a substance that helps new skin cells grow. It was mainly applied externally until the 1800s. Since then, the list of conditions it has been used to treat has become quite long, according to herbsarespecial.com. Despite people’s long history of reliance on comfrey as a healing agent, it has gotten a bad rap since 1978, when a rash of blaring headlines in Australia warned that this popular herb is a killer that causes liver damage and cancer. In 1984, Australia’s National Health and Medical Research Council placed comfrey on the nation’s Poison Advisory list. Internal use of comfrey in supplements was banned in the US in 2002, but it may still be sold in external potions. When you read the rationale for FDA’s concern, you will see it is based on indications, not human testing. What is the scientific research? In a Japanese study in 1978 (Hirono, Mori, and Hago), comfrey leaves and roots were added to the diet of baby rats for a maximum of 600 days and the rats were examined for tumors. Out of 28 rats fed 8% of their diet as dry weight comfrey, one showed a liver tumor at 600 days, according to herbsarespecial.com. Another study in 1980 by Dr. C. Culvenor’s research team in Australia, injected the suspect alkaloids into the peritoneal cavity of baby rats. To reproduce a comparative dose of the alkaloid in a human a person would have to consume approximately 19,880 leaves, according to herbsarespecial.com. Trials undertaken in 1983 by Dr. S. J. L. Mount of the Henry Doubleday Association in the UK, concluded that comfrey helps relieve pain. Mount supervised testing of 90 members with osteoarthritis and rheumatoid arthritis who took 4 cups of comfrey tea or 9 tablets daily. Participants experienced no side effects or symptoms of liver problems, but 23-35% said they felt pain relief and improved mobility. Henry Doubleday had become interested in comfrey’s benefits in the 1800s. He founded his association after observing numerous successful applications of comfrey as stock food and medicine. When forty long-term comfrey consumers were subjected to liver function tests in another Henry Doubleday Association trial, all were found perfectly healthy, according to Dr. Clare Anderson, from the Laboratory of Pharmakinetics and Toxicology, School of Medicine, University College, London. WebMD.com says comfrey is commonly used to treat ulcers, heavy menstrual periods, bronchitis, cancer and chest pain, but there is “little proof” of its efficacy. The site goes on to say that comfrey presents a high risk that can cause serious, and often fatal, complications, including, kidney and liver failure, liver disease, and death. According to Ingri Cassel, writing in the Idaho Observer in July 2002, comfrey is used as feed because it is considered the fastest builder of vegetable protein. In fact, the amount of vegetable protein obtained from an acre of comfrey can be nearly twenty times that obtained from soybeans. Broken arm healed in five days. The son of a registered nurse in Provo, Utah broke his arm, so she rushed him to the hospital. When the doctor x-rayed the arm, he told them the bone was clean broken, so clean that he would have to use a brace for a few days until knitting started, before applying a cast. He told them to return in five days. The arm was bare, so on arriving home, his mother put comfrey poultices and fomentations around the arm and gave him comfrey tea, comfrey green drink, comfrey tablets and capsules, and put comfrey into salads and steamed comfrey as a vegetable — in fact, she got comfrey into him every way she could think of. Five days later, when she took him back to the doctor to get the cast, the doctor took another X-ray. He said, “What have you done to this boy?” He proceeded to announce the bone was knit together without even a hairline crack. This story is excerpted from the article “Comfrey — Heaven’s Gift to Man” by Dr. John R. Christopher, M.H., The Herbalist, Volume 1, Number 5, 1976. If you spend any time at all around people who use herbs to promote healing, you have probably heard a few good comfrey stories directly from your friends. Comfrey saves baby’s life. Here is a story about how comfrey saved the life of my friend’s baby. Her two-month old daughter became plugged up and had great difficulty breathing. Doctors treated it as a bad cold at first, but the condition persisted for nine months. Four different pediatricians prescribed antibiotics, a humidifier, and misting machine, but none could find a cause or cure. The last pediatrician said the girl was dying and the mother should get her affairs in order. That’s when my friend went to the proprietor of a local health food store, who suggested she try comfrey. Dried comfrey leaves were made into a tea and put into a bottle. After drinking a few swallows, a brownish-yellowish mucus started coming out of the girl’s mouth, and she sounded like she was choking. The mother started cleaning it out, pulling it out of her mouth and then her nose, until she had extracted a mound the size of two softballs. That solved the problem. 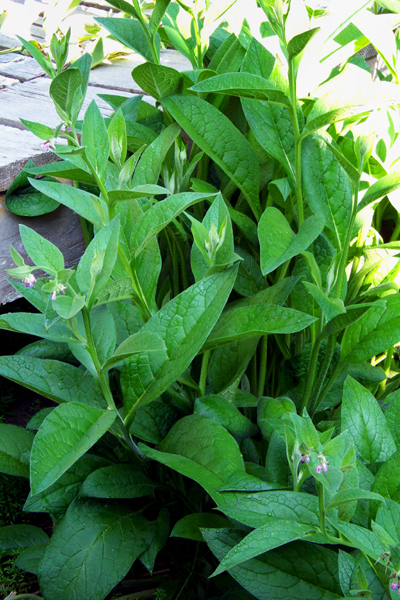 Should comfrey be included in the prepper’s medicine kit? So, what’s a prepper with a vigorous stand of comfrey to do? Are the benefits greater than the risks, or not? Has science even proven the risks? Are the scientific trials applicable to humans using moderate amounts of comfrey as food and medicine? Or, is its ban merely a move to protect the power and pocketbooks of the pharmaceutical industry, which plies drugs known to damage health? Whom should we trust? You are going to have to decide. As with everything in our complex world, independent thinkers need to separate the pepper from the fly droppings. “PA’s are believed to have an accumulative effect in the body and may cause hepatic vein blockage and liver toxicity. It is said that the PA’s are only converted to toxic metabolites, in the body, by the liver enzymes. When comfrey is applied externally to the skin, as a cream, it is not considered to be a significant intake of PA’s, in view of low dermal absorption of the PA’s. When comfrey is dried, enzymes are released and much of the alkaloid is destroyed,” according to herbsarespecial.com. The University of Maryland Medical Center says children, the elderly, pregnant or breastfeeding women should avoid using comfrey in any form. Same with alcoholics and those with liver disease or cancer. The U of M Medical Center echoes the opinion that people can die from taking comfrey by mouth. They say to avoid applying it to broken skin, and that topical use should not last longer than 10 days. Don’t mix comfrey with medications that are hard on your liver, i.e. acetaminophen, and avoid using it with other herbs “known” to cause liver problems, such as kava, skullcap, and valerian. Finally, only use comfrey with the supervision of your health care provider. I just received comfrey powder that I ordered, therefore no leaves. I’m not sure how to use it externally. Can you help? If it was me, I’d probably make an infusion, paste, or tincture. 3 weeks ago a hen of mine was attacked by a fox. Her wound left her with a gaping area of no skin and exposed muscle fascia that was approx 1/2 inch to 3/4 in width and 7 inches long. I have a degree in medicine and access to antibiotics and antibiotic creams for bad wounds. For 2 weeks I used these with no signs of healing. I was very afraid of that as gaping wounds heal slowly and the risk of infection and death is very real. In desperation i decided i had nothing to lose in trying comfry. I stopped using the convential medicines and ground up fresh comfry leaves and mixed these with raw honey. I applied this salve liberally over her gaping wound. Yes right on the raw skin edges and on the exposed muscle fascia and in one spot on torn muscle. This seemed to not only bring her pain relief but she also wanted to eat the salve mixture, so i fed her a little twice a day. Within 2 days there was 1/4 inch of new skin growth. This is real and i have photos. This is now day 5 and there are areas where the skin has totally connected now. I am totally stunned. And i am now a true believer in the power of comfry. Thanks very much for posting this experience you had with comfrey! I have used comfrey for various sprains and injuries as a poultice and salves with great success. I just started using as a tea from fresh leaves. I was researching your references but cannot find “The Safety of Comfrey, by J.A Pembrey”. Help please. Way back in 1977 my one-year-old daughter had fluid in her ears (common in Tidewater Virginia). Her pediatrician tried for months to get it to drain, unsuccessfully. Trying to avoid the tubes-in-the-ears surgery, I found comfrey root listed as effective for congestion in an old herbal remedies book and began feeding my daughter a scant bit in applesauce every day. The next time the doc checked her, the fluid was gone! We used it for ears until it was no longer available a few years later. Anecdotal for sure, but it might have been what cured her. Hi, my name’s Heather. This was a great article! I first learned about comfrey a few years ago. There was a patch growing down the street from where I lived. I started drinking it as a tea, and then after watching Susan Weed’s video about making a comfrey infusion, I tried that. After several glasses, I started having horrible pain, all over my body. My feet hurt so much, it felt like they were being crushed when I walked. I started freaking out, I had no idea what I was going through. It eased up after 48 hours. This was how I discovered I was fighting lyme disease. Comfrey is antibacterial and caused a herxheimer reaction. Since then, I’ve used this is my fight along with teasel root tincture and other antibacterial foods and spices. I have improved so much! I love hearing stories about how comfrey has helped other people, because it has literally changed my life. Thank you for sharing your testimony silverheather. I had not heard about teasel root being an antibacterial. Now I’m looking forward to making some! How did you deduce that the cause of the pain in your feet was a herxheimer reaction related to the lyme disease? I have been looking for something to help heal a very large hernia. I found a site that has Hernia Herbal Poultice…. and it is applied externally. Will this really help? I am so scared to try anything, but I can’t afford surgery either! I have never heard of healing a hernia with a poultice. For a hernia, you need to make comfrey tea, and be able to sit in a basin of the warm tea, and this will be of great help. Do this each day, and you will see results. Is this information that was passed down to you, or have you tried it? It seems far fetched, but I try to keep an open mind. Greenfingers, Thank you for that link to the Wiley Online Library – I had not seen it before. I have eaten comfrey (and fed it to my livestock) for long enough now that I ignore any advice not to consume it. Note there is still no proof of Comfrey causing any such problems and this is why the FDA use the terms ”implicated” or make an association. With a pharmaceutical protect, association or implication would not be enough, only hard data would suffice. Thanks again, although I did know of these other sites and the case you mention. I have done a great deal of research online regarding comfrey ever since the internet became available. I have grown it primarily for my livestock, but eaten it myself, for over 20 years. I still think Lawrence Hills is the best source of information and if you read his books (I prefer Comfrey: Past, Present and Future because of the extra info) at least you will not have people misquoting him, or extracts from the book. I have never tried the ointment, but was recently considering its production, and this thread has prompted me to do so. I just lack beeswax, having my own comfrey of course and my own olive oil, but I will get some wax in a few days. I might even take up small scale beekeeping again. I think it is only fair to let people know that whilst I have used comfrey extensively for so long, I now have a commercial interest in it, so my opinions could be construed by some as being biased in its favour. Hi Alan. I’m glad you’ve been inspired to make some comfrey ointment, and thanks for that book reference. I am currently putting together a post that documents my recent tincture making project, so hope you check it out. I’m trying to get that done today. Last summer I made some comfrey root tincture that came out very dark brown. It took a long time to pick and clean the roots and get them all chopped up, but a fun experience all the same. I swished with a solution that contained comfrey and black walnut and it appears that my chipped tooth has begun to repair. Ive noticed this chip tooth for many years and there has been no change until a day after swishing with that solution for about 20 mins and applying before bed. I still can’t believe it but I will continue to monitor just in case it turns out I’m just imagining it. I doubt it though, the chip is barely noticeable now. It also looks like other areas are increasing in enamel but the most severe area looks like it has changed less. I wonder if any of the other ingredients were responsible but comfrey seems the likely cause. Other ingredients were wildcrafted white oak bark, wildcrafted mullein leaf, wildcrafted black walnut. I have swished with black walnut on its own before and there was no difference in the chipped tooth or anything else. I have also been supplementing with tooth bulding wholefoods such as fermented cod liver oil, high vitamin butter oil and collagen but until swishing with that solution, the chip remained the same. Before this, a very small cavity did heal assuming my the model my Dentist did was accurate. That’s good news. I have been swishing with a tincture of comfrey for general tooth and gum health, but truthfully, I haven’t noticed much difference in my mouth. I also swallow this tincture. One thing I have noticed is the arthritic stiffness that plagued the thumb on my left hand is completely gone. I have also been drinking water with some lemon to balance blood PH, so, like you, it’s hard to tell exactly what the cause of the success is. wildcrafted white oak bark, comfrey root, wildcrafted mullein leaf, wildcrafted black walnut leaf, wildcrafted marshmallow root, wildcrafted gravel root, wildcrafted wormwood herb, wildcrafted lobelia herb, & wildcrafted skullcap herb in a base of pure extra virgin olive oil & wheat germ oil. Let me know if you decide to try it. I got a bottle from iherb for $13. Will let you know if I try it. Many people are scared away from Comfrey because they think it is a poison if in gested and the FDA report seems to confirm this. Well the FDA report is cleverly written, uses a lot of spin and misdirection. There are many contradictions and generic phrases to throw you off balance but I draw attention to this particular statement made by the FDA towards the end. Note it is not towards the end by accident and it is certainly not the very first point made for a reason. Think about it, what is the difference between ”information is generally lacking” to not having any evidence? What is the difference between not having any information that establishes cause-effect to not having proof of that. Think about it and ask yourself why the FDA wrote all of those words when one phrase would have told you they had no information period. Most will read the report and allow the language used to confuse them and some websites will propogate the lie while ommiting the source. I know some people will never use Comfrey now and think it is a poison. Ive now gotten hold of the powdered version of those ingredients and place the powder into two dental trays with a few drops of water for over night use. I’m not sure if teeth being coated in the olive oil base is good for them i.e, it may not be good for remineralization. The first thing I noticed were brighter teeth but it is early days yet. I think the more time the Comfrey has in contact with the teeth or gums, the better. I may try pure Comfrey powder instead of the BF@C Powder some time though. I agree with you, Greenfingers — love that name btw. Also, people might want to compare the FDAs comfrey statement with disclaimers that often accompany their approved medicines…bleeding from every orifice imaginable and thoughts of suicide, etc. Comfrey is AMAZING. Two examples. A neighbour, in his late 60’s, with a broken foot, applied comfrey cream three times a day. Within a week it was healed. The doctor couldn’t find the break which had shown on the initial x-ray. The second is a recent case a few weeks ago. A friend in this 20’s fell of a motor bike, breaking his collarbone in six places. Again I suggested comfrey cream. He applied it three times a day and in a week he had reasonable movement with the arm, no pain and was sleeping very well. After two weeks he has full motion of his arm and the feeling has returned to his hand. He is amazed, having gone through the trials of broken bones before with a long, slow recovery. It has been estimated that 3% of the world’s flowering plants contain pyrrolizidine alkaloids. Honey can contain pyrrolizidine alkaloids, as can grains, milk, offal and eggs. Personally, I think we could call the demonizing of comfrey, the Comfrey Conspiracy just as there is the Borax Conspiracy. Any remedy which is natural, unable to be patented, cheap/free and effective is a sure target. Thankfully we still have a choice with some things, and I choose to use both these natural products because they work so well. If you are concerned about alkaloids, the Russian Comfrey (Symphytum × uplandicum) is said to have fewer than the Common Comfrey (Symphytum officinale) and the dried and young fresh leaves have lower levels. Thanks Julie, I will check out those links. A fairly good article on the generic term “Comfrey”. Unfortunately some of your information in the part “Scientific Trials” is factually incorrect, partly because you have misread the ill.informed “Herbs are special site”. Dr. MacAllister was dead long before 1988. If you really want to know about comfrey, the only place to begin is with the work and writings of Lawrence D. Hills. In various articles, a book and a blog I have tried to steer people towards LDH, the only post-war source of accurate information. The Internet is full of absolute nonsense, and again unfortunately repeated by people who believe what they read on other sites. I do not expect this to be published, but I thought you should know for your own information. Hey Old McDonald. I don’t mind printing stuff by people who disagree with me or are straightening me out. I hope to follow up on the reference you provide. The important thing is to know how to use natural remedies when we need them. I did not realise my comment would be immediately published, I thought it would have gone direct to you – that is the way my blog works. That way I can block spam. I eat comfrey, feed it to my livestock and use it as a fertiliser. Symphytum species are very underrated by mainstream agriculture – in fact it is ignored. Great shame. It does go direct to my email, then I decide whether or not to include it. Thanks for being in touch. I made a tea from mature comfrey leaves and used it as a soak for my arthritic feet and it worked. Other medications had little effect but the comfrey really takes the pain out of osteoarthritis. Awesome. Thanks for sharing your experience. This entry was posted on July 30, 2012 by simpleunhookedliving in Herbs from God, Preparedness and Off-Grid Survival and tagged banned herbs, comfrey, Knitbone, medicinal herbs, natural healing.